Charactures by Daemon Donigan. Animation by the webmaster. .Steve has been nominated for "Best Jazz Artist" for the 2015 Omaha Entertainment and Arts Awards. Listen to a radio interview Steve did with Jim Clark of South Dakota Public Broadcasting. 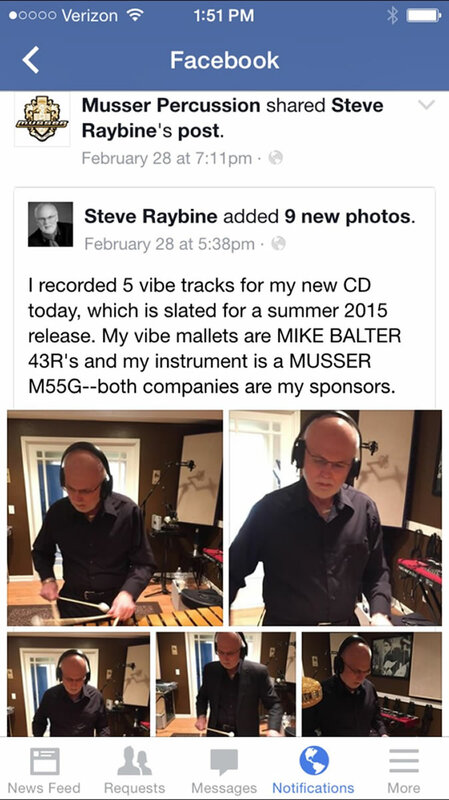 Here are screenshot pictures of Steve playing the vibes with Mike Balter mallets and Musser Vibes. Steve has a new series of Music Motivational Posters on Fine Art America. The posters convey motivational messages for aspiring student musicians. Here is an example of one of the posters. 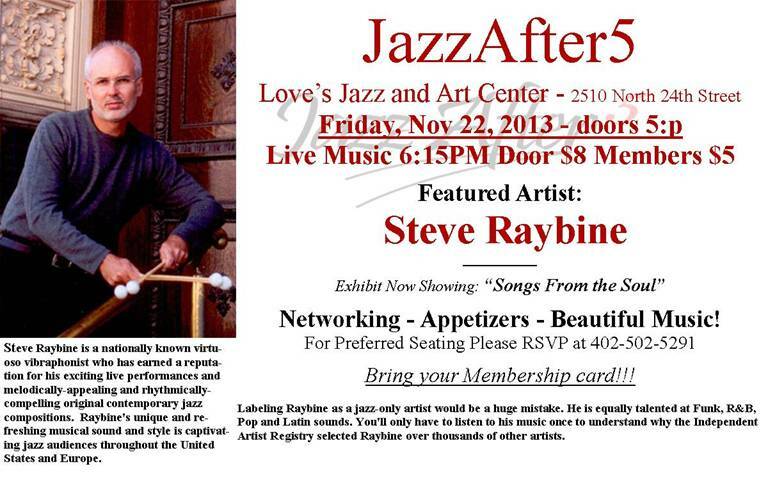 Steve performed at the Love's Jazz & Arts Center on Friday, November 22nd. See an advertisement for the event. 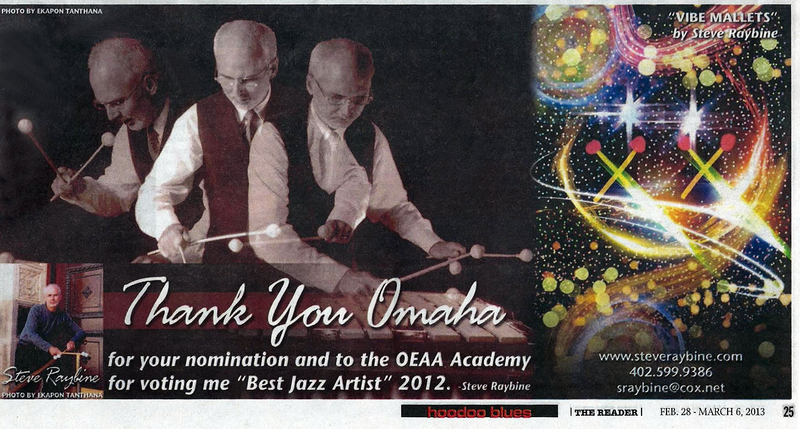 Steve has received 2012 Award for Best Jazz Artist from The Omaha Arts & Entertainment Awards! View Steve's message of thanks to Omaha for this award. Steve closed out the Thursday Nnight Smooth Jazz Series at the Ozone on January 31st. See an advertisement for the event. Steve's latest recording "In The Driver's Seat" is now available on Pandora! Click here to visit the Pandora website. Videos of Steve and his band performing at the 2011 Jazz on the Green concert series are now available. Click here to go to the video page. Steve was nominated as Best Jazz Artist for 2011 from the Omaha Entertainment Arts and Awards. Congrats Steve!! Turn back the years to Steve's band Auracle and Sno' Fun. Listen on YouTube. Steve performed Thursday, August 4th at the Jazz on the Green at Midtown Crossing Concert Series. The concert at Turner park was well attended and featured two impeccable sets of music by Steve and his band. The Omaha World Herald website promoted Steve's gig at the Jazz on the Green at Midtown Crossing Series. Read a .pdf of it here. Steve was nominated for Best Jazz Artist in the Omaha Arts and Entertainment Awards competition. He performed at the Omaha Entertainment and Awards Show Sunday, February 13th at 6pm at Harrah's Casino and Convention Center in Council Bluffs. 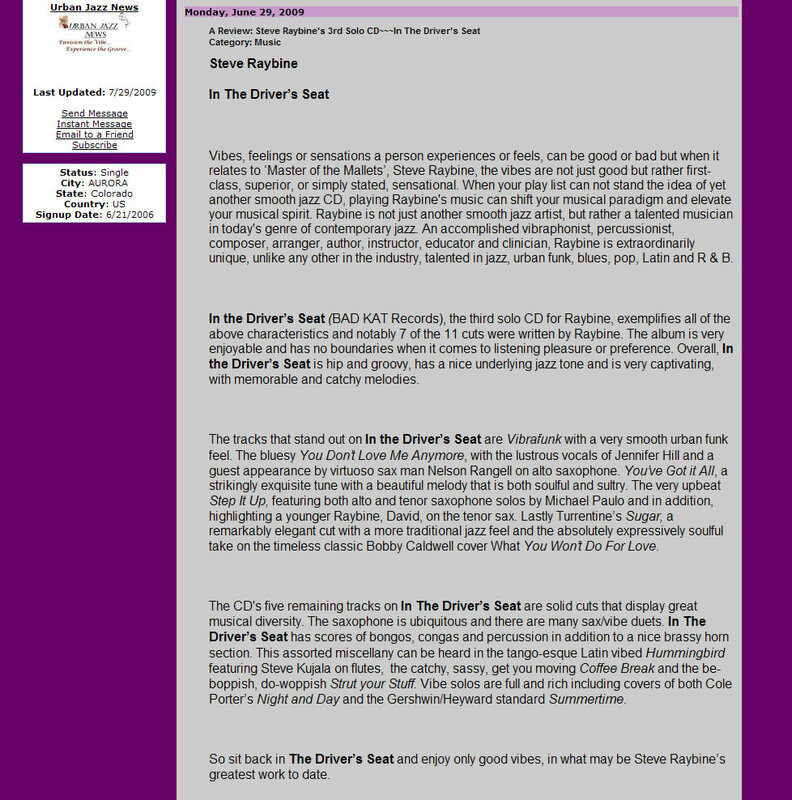 Steve is one of the featured artists in the November 2010 edition of "Smooth Jazz News". Steve is one of the featured artists this month on 'Music Up Close With Janie' on Skopemag.com. See a screencap of the review here. Noted jazz journalist Scott Yanow has reviewed Steve's In The Driver's Seat. Read it here. Steve was one of the many renowned artists on stage for this year's Omaha Riverfront Jazz and Blues Festival. 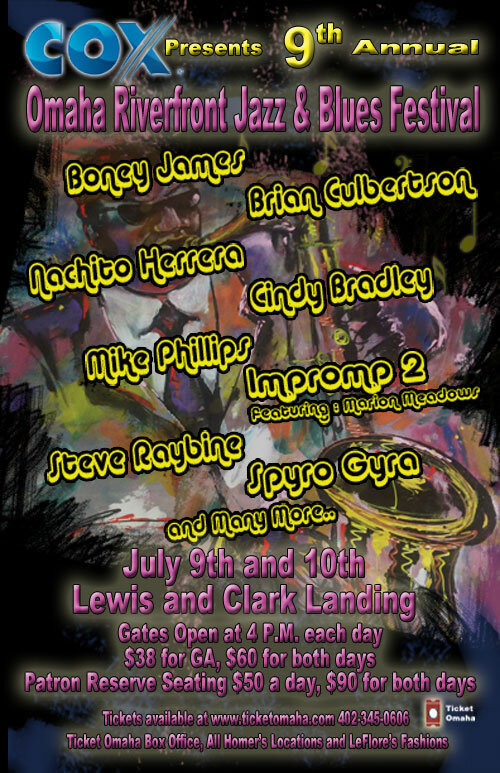 See a screencap of the Saturday July 10th lineup. You may also see a screencap of an advertisement for the festival. Here is a composite of the festival program and a blurb about Steve. A screenshot of a Google search on "Steve Raybine" that yields many, many results..see it here. Download and read Steve's updated bio. 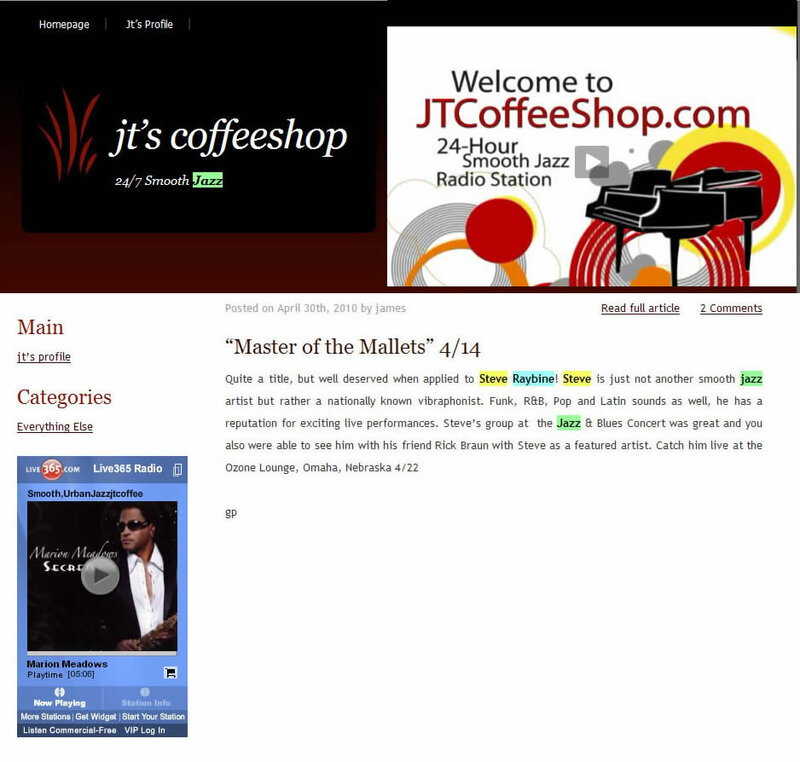 A review of Steve's In The Driver's Seat was featured on the prestigious nosolosmoothjazz website based in Madrid, Spain. View a screencap of the page with article translation to English. 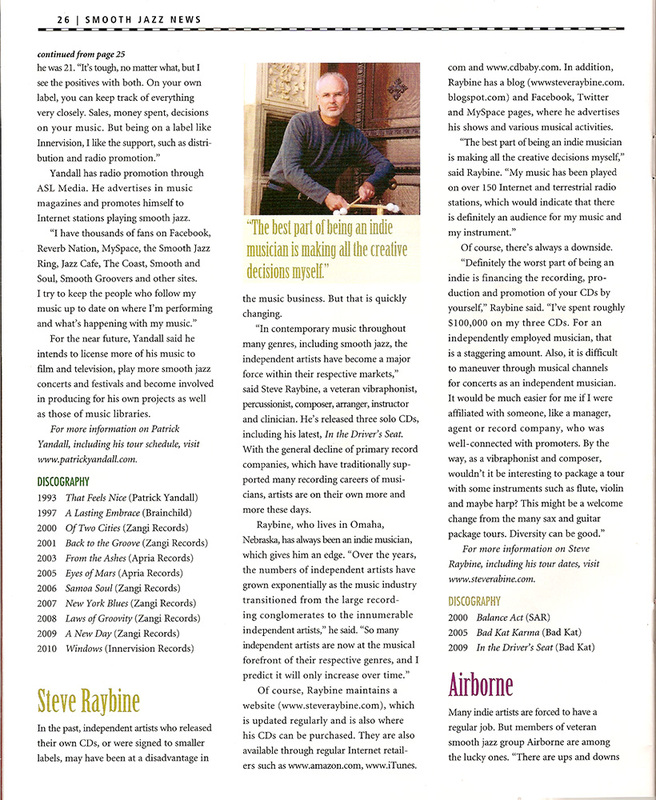 Steve's In The Driver's Seat appeared as a selection in the January edition of Jazziz magazine. View a screencap of the page here. Steve was the subject of an article published in The Reader which you may read here. Steve is now a featured artist on RadioIndy.com. Visit their website here. Steve has officially launched a new blog. Read it here. 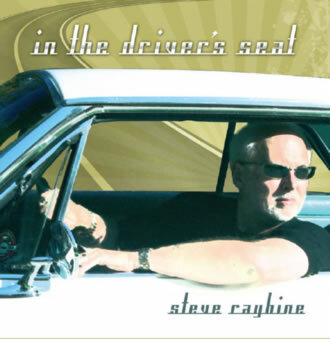 Steve Raybine has officially released his new recording, In The Driver's Seat. You may purchase that new disc and his previous recordings at the new Buying CDs page! VISIT STEVE'S NEW CD BUYING PAGE AND BUY THE NEW CD! Read an article just published in the City Weekly Newspaper about Steve! See a screenshot of Steve Quirk's page. 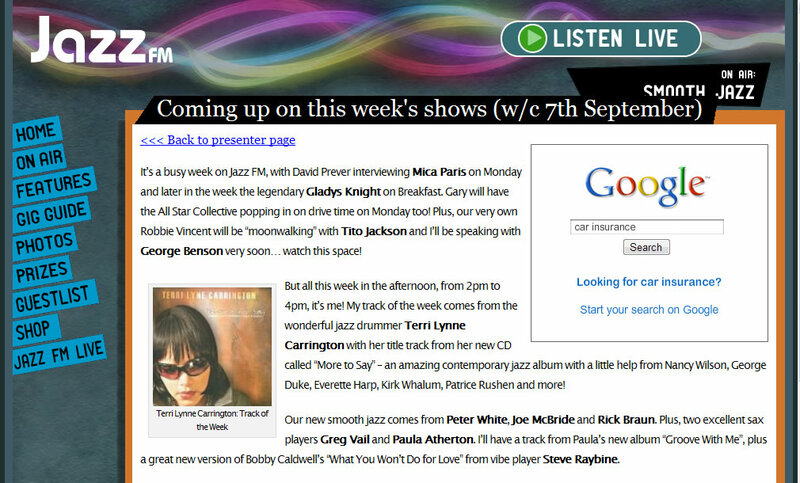 Quirk is from the radio show Fusion Flavours in the United Kingdom on www.jazzfm.com. 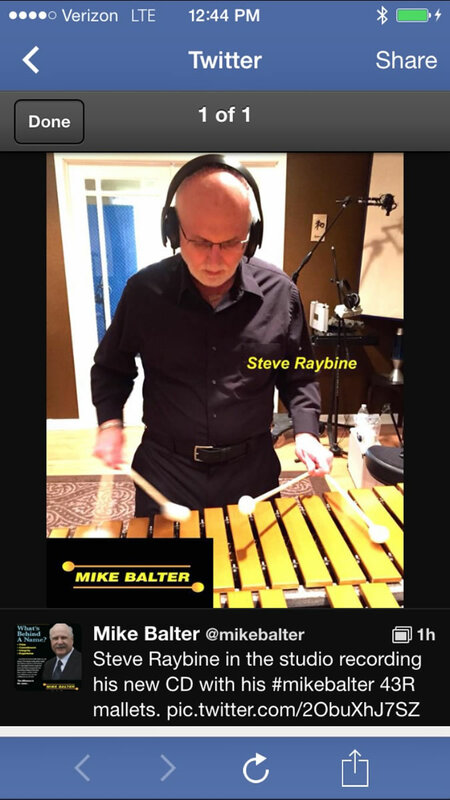 He said of Steve's new disc:"...Plus a great new version of Bobby Caldwell's What You Won't Do for Love from vibe player STEVE RAYBINE." 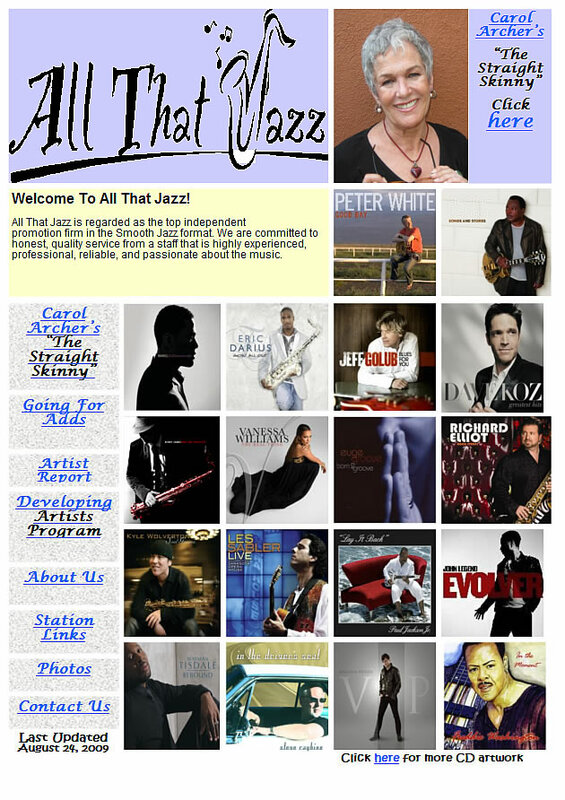 See a collage of album artwork as featured on allthatjazzinc.com that includes Steve's In The Driver's Seat CD cover artwork. Billboard Indicator: #2 Most Added!